We went camping this past weekend, and what better way to celebrate camping than to play camping themed board games? This week we take a look at CAMP: The Game that Grows With You, the Dr. Toy award winning game from Education Outdoors. CAMP has a lot of features that are really appealing, but do they come together to make a compelling experience, or does the mix of mechanics create a natural disaster? Let’s take a look and find out. At its root, CAMP is a trivia game. Players roll a die, travel along a path, and when prompted, answer questions. 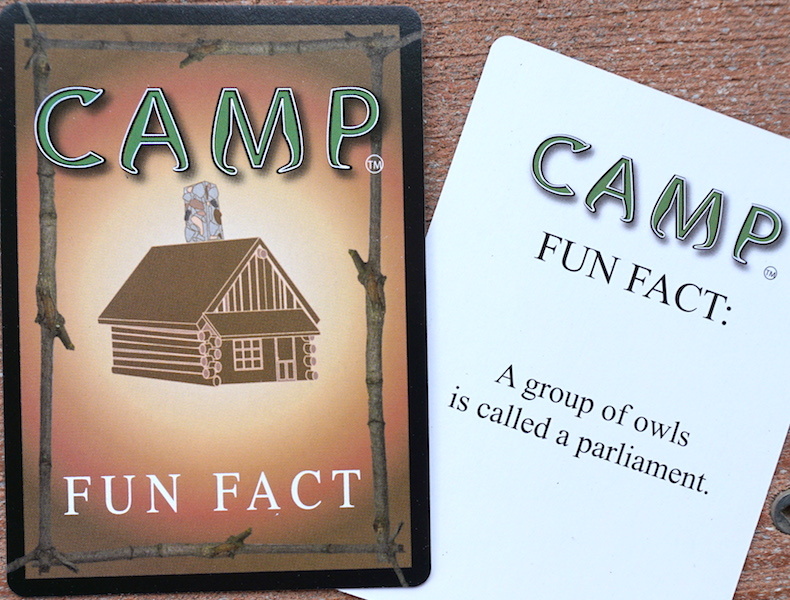 In this, CAMP is like most other trivia games. However, once the question cards come out, then the beauty of CAMP shows through. Before we get into this, let’s take a step back and look at the context in which we’re evaluating CAMP. We are a family, two adults, three kids. We took CAMP on a camping trip with a bunch of other families, so there was a wide mix of age ranges up and down the spectrum. This is absolutely where this game shines. At one point, we had two adults, two teenagers, and three primary school aged children playing at the same time. We talk a lot about the value of rule-shifting to accommodate different ages in play, but CAMP has it built right in. The shining mechanic of CAMP is this built-in level system. At the beginning of the game, each player chooses a level, 1 (beginner) through 4 (hardest). Each card has questions for each of the four levels, and usually these questions are related to each other. In this way, CAMP absolutely grows with you. As players either get older or learn the cards they can up their level to get harder questions to answer. On the game track there are three possible icons on the spaces. The first, the white footprint, means nothing happens when the player lands there. If the footprint is green, the player must answer a trivia question. If they get it right, they can roll again and continue the round. Some cards have compass icons on them. If you answer a question correctly on one of these, you get the Compass Card. This is a powerful card that enables you to take a shortcut halfway through the game and cut the route nearly in half. Of course, if someone else answers a compass question right, they take that card from you! The last icon a player might land on is the Camp Clubhouse icon. If a player lands here, they go directly to the Camp Clubhouse (good in the early going as it moves you ahead, bad later in the game) and they read a Fun Fact card. These facts are genuinely interesting and we all learned quite a bit from them. All of the cards in CAMP are nature themed, so it fits very well into the camping environment. In fact, almost everything about CAMP is well-designed for outdoor play. The Question and Fun Fact cards are housed in half-boxes designed to hold them for play like most other trivia games. The character tokens are animals with cute names cut out on cardboard with plastic standees, which are durable enough to handle the outdoors on a mild day. The six-sided die provided to roll is huge. The bright red die is about 1.5 inches on each side. Even if it rolls onto the ground it’s simple to find. The design, art, mechanics, and components combine to create a genuinely wholesome game that allows up to eight players of almost any age to come together and play a wonderful trivia game. The mechanics of the standard game aren’t earth-shattering, but the multi-level play really lifts CAMP to the next level and makes it a game we will be sure to return to in the future. At under $20, it’s an inexpensive and wonderful way to gather the family around the picnic table outside your tent. You can find CAMP on Amazon. Education Outdoors provided The Family Gamers with a review copy of CAMP: The Game that Grows With You.